WANT A NEW LOG/TIMBERFRAME HOME? HERE'S AN EARLY CHRISTMAS PRESENT! Home→Savings Offers→WANT A NEW LOG/TIMBERFRAME HOME? HERE’S AN EARLY CHRISTMAS PRESENT! 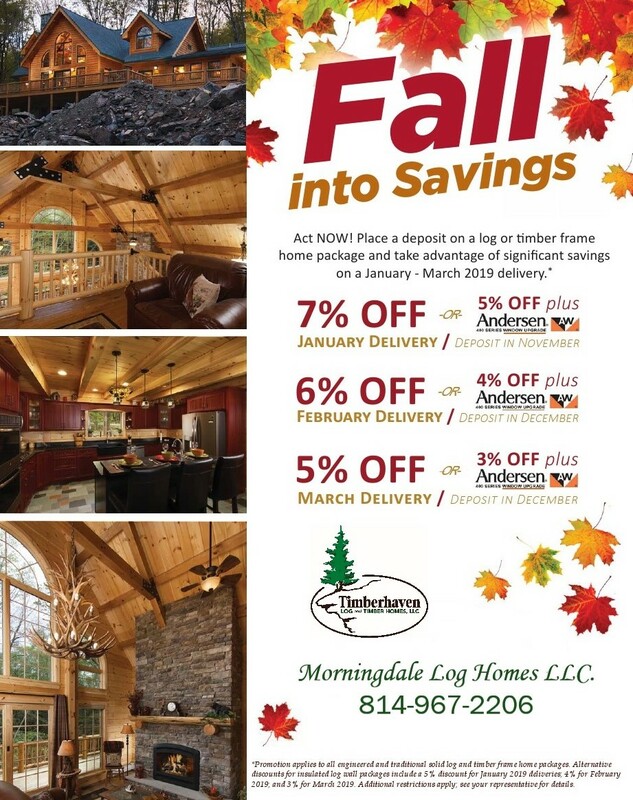 With only 78 more days until Christmas, Morningdale Log Homes and Timberhaven Log and Timberhomes have teamed up to offer our Clients one of the best sales we have ever offered -and you can save thousands of dollars on your package and save energy for years if you select the window upgrade as well! Now THAT is a real deal! To take advantage of these savings, just contact us and we can work with you to obtain financing, select a design and customize it, obtain an estimate or quote, place your order and accept delivery between January 2019 and March 2019 to qualify.